I am rather puzzled by the many references I have seen recently to soya milk/soymilk “mordant”, as I would not describe soya milk as a mordant, rather as an assistant in certain dyeing and fabric patterning processes. In my understanding, soya milk has the same purpose in Japan as buffalo milk has on the Indian Sub-Continent – in both cases the milk solution is used as a binder or sizing agent, applied to fabric before mordanting or dyeing, in order to increase absorption and to prevent wicking and improve the sharpness of the outlines when painting or printing mordants, pigments and dyes on fabrics. Unlike a true mordant, soya milk solution does not form a chemical bond. I have never known soya milk solution to be traditionally applied to yarns rather than to fabrics and as far as I know it is not commonly used on woollen fibres. However, as my experience of using soya milk solution is not extensive, I decided to conduct some tests. I prepared the soya milk solution as follows, using information from John Marshall, (http://johnmarshall.to/H-Soymilk.htm), who is an expert in this field. I soaked one cup of soya beans overnight in three times their volume of water and then, when they had swollen, I strained the water off and rinsed the beans. I then added water to the beans (again three times their volume) and processed the mixture in a blender until the beans were well ground. I then poured the mixture through a piece of fine cloth spread over the top of a bowl and strained off all the liquid. I repeated this process three times with the same beans, each time adding the blended liquid to the previous solution. The final combined solution should be about the same consistency as cow’s milk and must be used fresh; as soon as it starts to become sour it should be discarded. I then poured the soya solution into a bucket and added the washed and wetted materials. If necessary, more water should be added to allow the materials free movement in the liquid. I left the materials to soak for about 12 hours, moving them around from time to time, then removed them, squeezed them well and left them to dry. I repeated this process twice more but leaving the materials in the soya milk for only 5 minutes each time. I then left the materials to dry and cure for 2 weeks before using them. 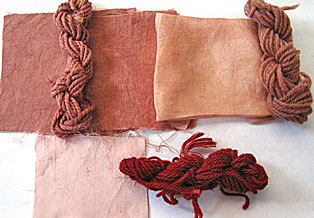 I then tested the materials treated with soya milk in dyebaths of madder and meadowsweet. The madder samples are below. 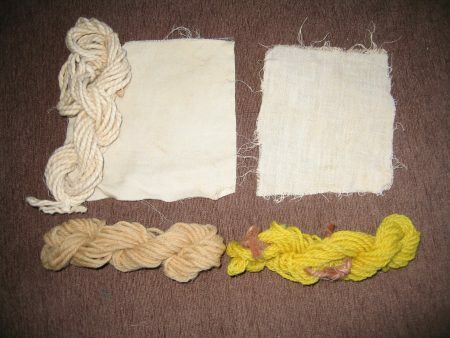 MADDER ROOT Top from left: linen fabric, cotton yarn, cotton fabric, silk fabric, wool yarn (all soya milk pre-treatment & no mordant) Below from left: cotton fabric (no soya milk treatment & no mordant), wool yarn (alum mordant) I think these samples clearly show that, while the soya milk treatment improved the take-up of the dye, it did not act as a mordant in the way that alum does. That is to say, it did not give the red colour associated with madder on an alum mordant and produced the sort of colour one would expect from madder applied without a mordant. While soya milk is certainly useful in some circumstances as a pre-treatment for fabrics, I think it is misleading to imply it can be used instead of an actual mordant and this may lead to disappointment. Note: the meadowsweet samples, which I have mislaid, showed even more clearly that the soya milk did not really act as a mordant. Meadowsweet gave only a very pale colour on both the soya milk treated materials and the untreated materials but it gave a bright yellow on the alum-mordanted materials. PS Below are the meadowsweet samples – found at last! This entry was posted on Monday, November 13th, 2017 at 10:17 pm and is filed under General Dye Information. You can follow any responses to this entry through the RSS 2.0 feed. Both comments and pings are currently closed.